I went to the synod offices mindful that my words being a help to Rev. Hara were a long shot and the likelihood that I might offend was more of sure bet ( I would’ve put the odds of the later at 2-1). Fortunately the three men who greeted me (Rev. Nkhoma, Rev. Nyrendo, and Rev. Munthali) know how to handle the less than tactful. The conversation began with official business. The council of the Presbytery of Northern New York asked me to inquire as to the renewal of our partnership next year. Having been here for two months and watching groups come and go and seeing the way individual churches interact with the synod of Livingstonia versus presbyteries I am convinced that the renewal of our partnership should articulate both directions. Congregations have far more latitude to act while presbyteries carry the gravitas of the “larger church.” Both are good I said. After my third apology he smiled again. “There are some people there who love Rev. Hara and some who hate him. If you spoke in favor of him you will necessarily make some people angry.” We all smiled at this and nodded from the collective experience of being pastors. As we spoke of the decision it was clear from their words that it had been a real struggle, a great debate. What was unanimous was that they all had great respect for Norman. What divided us was that I felt the synod was acting prematurely and they felt they had actually let the situation go on too long. For this reason I don’t think my suggestions will prevail. The shock was the coincidence that for the last six months I have been doing research on 1 John, a book that is built around the impact of sects upon the early church. Never in my wildest dreams would I think that my time in Malawi would have been shaped by the same force that shaped the book I was studying. It was the sort of thing that just baffles me. I know it’s the Holy Spirit, but sometimes I would like to have some sort of clue where my life is going before I get there. For the last four days I have been making farewell speeches. Everyone is convinced here that I will return, but they have said again and again, you don’t realize how hard it is to say goodbye. We will cry they claim. Part of being a pastor is not letting your emotions overwhelm you. I am not saying you need to be a stoic rock of indifference, but you do need to keep your composure in the midst of very emotional moments. I want to say that I have led hundreds of funerals. There have been many moments where the person being buried was a dear friend. To not have the opportunity to weep in the midst of worship, I believe, is part of the cost and gift you give to others. You create the place for them to feel free, while you yourself do not enter such a place. A pastor creates the opportunity, you hold the door open so to speak. Saying farewell, then, is mixed. I am saying goodbye to friends, but I am also saying farewell to a unique time, a gift of time whose value I have seen again and again as immense. In most of my speeches I talk about the difference between being in Malawi for two weeks and being here for two months. The difference is profound. It is the difference between living some place and visiting. While I know that I will visit Malawi again, I am very mindful that my next visit will be based upon having lived here. I look forward to what that will mean. Mostly though as I say goodbye I am just mindful that a great gift has been given. A time of renewal was given and for that I can’t be thankful enough. As I have said this to my Malawian friends the emotions have been far more complex than I usually allow to linger. I am not sure if that is a normal part of a sabbatical, but I am glad it was a part of mine. It’s been a good day in Mzuzu. We are in countdown mode. We have been here for eight weeks so far and this week will be our last full week here. This Sunday will be our last Sunday in Mchengatuba where Fred has been made Rev. Hara’s “associate minister.” Suddenly we have gone from gaping amounts of time to fill to only one week to wrap up loose ends and leave Mzuzu by next Thursday. Fred shared with you about visiting the widow who had their houses roofed for them by Mark Purcell when he was here visiting the end of July. We had a great afternoon touring the different houses in the dambo last Thursday. At the 1st house we went to Laura asked if they had bednets (if you remember the dambo is the free low lying ground that is overrun with mosquitoes during the rainy season). At each of the six houses we found than none of them had bednets and at three of the houses the widows said they didn’t have a bed but would like a blanket. How do you even fathom such a thing? No bed, no blanket, but ever so grateful to now have a solid roof over their heads. They were so thankful to us and I wished so much that Mark could see the joy and hope he has brought them. The next day Sam and Grace went to work finding the best deals on wooden beds and mattresses. By Saturday, the carpenters they had contracted with had completed three of the beds (three quarter size) and we picked them up. After loading all three on the top of Jodi’s van we headed into town to purchase mattresses. After getting them rolled up and stuffed into the car with the 9 of us (sans Fred who was on top of a mountain a couple hours away observing a synod election) we carefully drove to the dambo. As we started out Sam said, “We will have to go the back way so we don’t get stopped for overloading.” I thought O.K. that sound about right. We arrived without incidence and were able to deliver the beds to the widows who had no idea we were going to get them for them. It was a very good day. That was Saturday. Today, Monday, we did our shopping in the market, finally, found the phone company, purchased some more blankets, renewed Laura’s, Beka’s, and Zoe’s visa, found a warehouse to buy porridge for the dogs, and delivered the rest of the things for the widows to Sam and Grace. Almost as an afterthought Grace handed me a folded envelope. I asked her, “What’s this?”. It was Ruth’s passport and visa. Ahh! Finally. I didn’t think I was ever going to hold that in my hand! Then Grace tells me that they’ve stamped it for an unprecedented two year period. Unbelievable. We are awed and stunned . . . and very, very excited. I went for a hair shaving today. Grace knew an expert and told Sam the directions. Leaving her house I was uneasy. I felt like we were being sent into a strange world. Neither Sam or I knew who or what this expert was going to be. This was the only time I have ever hesitated with Grace. Reaching the shop it didn’t sit well. This was a beauty salon, not a barbershop. Fortunately the expert was out; she was at a funeral. Had she been in I would have been forced to sit like a carnival exhibit. The ladies in the shop had already given many glances my way suggesting this was not the place big white men should wander. Sam knew of another shop so we headed off. Walking into this shop it was much of the same only a little less high end and there were two men working there. All of the clients gave the same look as the other shop, but the stylists started a conversation with Sam. They knew where I should go; I should go see Peter. Sam knew Peter and was excited to find out he too was an expert in cutting white people’s hair. “You see it’s easy for us. They just shave it off. But with you it’s more complicated.” Being a hairdresser’s son I thought, you don’t know the half of it. It turns out Peter was more than ready for the challenge my hair had become after three months without a trim, let alone a cut. I kept hearing him say “hair shaving” in my head as Peter started working. He started as he should with the sides and then the back. With this done his rate of speed dropped dramatically. It was now left with the top and I could tell by his technique that “expert” may be a bit of a stretch. So I turned to Peter and said, “lets just take it all down.” With that we were back at normal speed and confidence. As Peter lowered my ears Sam chatted him up with gossip and helped himself to their razors to trim his aspiring goatee. “Florence,” he said, “she works next door.” I knew Florence was a hairdresser and that she worked in this general location, but I was surprised and amused to think she was just next door. Florence and Chimwemwe have proved the real hold outs in the youth choir. Almost all the others have come to Rev. Hara’s house to apologize. Anthony hasn’t, but I don’t think that will last; Lusaka came with two others to apologize but had to take a call before the apologizing started. Florence and Chimwemwe, though, flat out refused. With my hair ready to pass boot camp inspection, I gave Peter a generous tip and told him he was indeed an expert. After lunch Sam and I came back to Peter’s shop with my camera. I wanted a picture of Peter. It was a moment to remember. With the picture done, Florence appeared. She said hello and shook my hand. “I thought I saw you before,” she said. “Are there a lot of mzungu that get their hair cut here?”, I asked. She laughed. “Have you spoken with Rev. Hara?” “Yah, three days ago.” With a little more awkward chitchat done I thanked her and walked away. Later in the day I spoke with Rev. Hara to see if what Florence said was true. It was not. That was my suspicion, or my expectation. Yet, I still don’t understand it. How can truth be so fluid in such a small place? I mean I can’t even get my hair cut in a town of a quarter of million folks without running into one of the fifteen choir members. What sort of world is this that no one believes anyone can just not tell the truth? I would expect truth telling to be tantamount here. In a moment like this I feel like quite a novice, quite a beginner. I have experienced lies before. Seen people lie to themselves and others. And I know the words of Shakespeare, what a tangled web we weave when first we practice to deceive. Standing outside of the “hair shaving” shops I felt the dizziness and disorientation a fly must feel in an intricate web. I felt like I was in a strange version of extreme home makeover. I loaded up the ambulance with Kathy, Laura, Zoe, Sam and Rev. Hara and we headed for the dambo. Our purpose was to visit all the houses that received new roofs thanks to the Widow’s Fund and Mark Purcell. We visited six houses altogether and each one had it own surreal quality. As we were leaving the first house Laura said, “does she have bed nets?” I was not used to offering things, leaving this in the hands of the Malawians it never occurred to me. Of course they didn’t. I asked the widow if she and her six children would use them she said yes. So Kathy got out her small notepad and wrote six bed nets. At the next house we could see that the house, while improved with the roof was still a bit on the rough side. There were no windows, the chambuzi was a scary sight, and the gaps below the roof were sometimes a foot deep. “What would it take to finish this house?,” I asked Sam. He spoke to the widow: bricks for the gaps and glass for the windows. We tossed in bed nets and a concrete slap for the chambuzi. I handed her 1,000 kwatcha to start her on the purchase of glass for the windows and this was a nice moment. When we were at the next house, which was literally the next house, we could hear shouting. We looked back and the widow was indeed dancing. Then she did something I have never really gotten used to: she rolled on the ground at our feet. This is a Tonga custom to express extreme gratitude. It is definitely extreme. The last house a safety code nightmare. It was small, not just in terms of square feet, but also in proportion. The doorframe couldn’t have been more than five feet high. The widow wasn’t much more than four feet and her grandchildren were all small so this was not a problem for them. Here too we tried to find out what it would take to finish off the houses to get them a moment where the widows felt done. I don’t think we provided more than $100 to each, but it was as if it were $100,000. The roof for each house cost about $500 so our “finishing” touches were nowhere near as substantial. But there was something in the flourish, the lottery win, the dream. Sometimes when I have watched our version of extreme home makeover the extravagance is a bit much. Yet, with our widows today I felt like extravagance was the point. It was supposed to be big moment. It is a sobering moment, though, when a blanket is a really big moment and a bed is just too much to even hope for. After the choir sang their last concert in Bennington, Vermont we went for a walk the next morning. There is a great obelisk with a view of the surrounding valleys Scott Barton said we needed to see. As we walked the sidewalks lined with homes older than Christianity in Malawi I got the sense that our young friends were more enraptured by the size of the homes than their history or architectural style. With the challenge of bringing 15 Malawians to the U.S. very fresh in my mind, I tried to explain to both of them that this may take some time, it may not work the first time, and it will be even more complicated in that it will involve schools, medical insurance, and lots of luck with the consulate given Ruth’s age, she had just turned nine. One year later, after many phone calls, meetings, forms, and long waits the assistant consular of the U.S. to Malawi said, “Mr. Garry, we can’t by law give Ruth a two-year visa, I can only grant one year.” Hence without a lot of fanfare, a great dream was realized. Later that evening at dinner I asked Ruth, “so do you still want to come to the U.S.?” Having lived with us for the last month she laughed and said, “yes” with a sense of determination. Our first visit to the consulate on Monday was not as fruitful. They didn’t say no, but they didn’t say yes. They said, we need more information. What they really wanted was financial records from Kathy and I that would prove we could fund such a venture. As the consular looked over our documents what bothered him was that we had some money in our accounts. It was recent money was the problem. 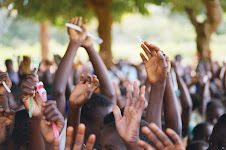 Coming to Malawi was funded by the Lily Foundation. Before we left I deposited all the funds that were remaining after the plane tickets, shots, pills, and passports were secured (everyone also got a pair of sandals). Let’s just say, Lily was generous so there was a lump sum deposited just before our departure. He wanted to know about this money. Why would someone coming to Africa to bring back a 10 year old girl suddenly have an infusion of cash? He was wondering if Ruth was a victim of human trafficking and if I was a kind of modern slave trader. It was at that moment I wished I was wearing my collar and had asked the congressman to draft a letter describing who we are, that I was a known entity in a town, in a church. All he had was a note I drafted on plain white paper and our bank statements. Phase three of the sabbatical seems like it is beginning. The struggle of abiding is giving way to the joy. When we pulled up to the boat launch for Mvuu Camp the park ranger who was there last year walked over and re-introduced himself. He remembered not only that I came to Mvuu last year, but the people in my group, that I was a pastor, and that it was a different time of the year from when I visited before. It took about two minutes to get the reason for his conversation. In addition to being a park ranger, he was . . . wait for it . . . an elder in a local congregation and, surprise of surprises, they were building a new sanctuary. “It’s not far,” he said upping the ante. Now I’ve learned to trust these moments in Malawi. Let them be what they are. If you can stop by, stop by. But also realize that if you agree to a “visit” it may morph into a big deal and a few hours. My first impulse was to say, “we are on safari,” and to suggest perhaps another time would be better. But there would be no other time, there just wouldn’t be. To boot, he described his struggle the last year. As he was doing rhinosceros research a branch swung into his truck and literally stuck in his eye. “They sent me for surgery in Blantyre. I am better, but still not all right.” The not all right part was keeping him on limited duty and off the big program and excitement that had been his life. I told Kathy later, this was the clincher for me. She was not very excited that instead of going directly for lunch, we were headed for a the ambiguity of a meet and greet. It was past 12 and in Malawi you get into the rhythm of three meals with no snacking in between, so she was afraid the troops would revolt if they needed to sit through a two hour long tea service where they were being told again and again how they are “most welcome” and “self-service, please”. It was indeed a short drive from the boat launch to the church. And true to form there was a very large sanctuary next to a smaller one. The newer one lacked a floor, roof, trusses, windows, and doors. This the elder explained had taken two years. But now they lacked the funds for the rest. This is a common sight around Malawi. It looks like a build has caught on fire and left a shell, only there was no fire, it was just that there was no money. Given the quality of the soil, clay to make bricks is out everyone’s front door, so walls are not a problem. But the cash to purchase the iron sheets for a roof or the holy grail, iron trusses, this is a big problem. Doors, windows, pews, and a floor are pretty easy to find. But the remaining two items (roof and trusses) are the real cost of construction, which for this church would be about $15,000. All of this I understood going in. What is still hard to fathom, no matter how many times you do this, is to be seen as a big bucket of money. This was a church in another region from where I work, an elder I spoke to casually once a year ago, but maybe, just maybe, I might just write a check. It could happen. When the pastor finally came out from his lunch, he was “out” when we arrived, he was just as crestfallen when I described the impression the people in the North would have if I started building churches in the South. Their sadness lasted for about thirty seconds and then it turned to laughter as they did try to imagine it. “I think they would say, ‘we have a few more churches to build up here.’” The North, indeed, has many churches without trusses and iron sheets for a roof. To get to Mvuu you drive south from Lilongwe about three hours. The road is hilly with lots of mountain curves. You are stepping into yet another climate of Malawi. The villages here are built in the valleys and they look like small worlds unto themselves. Once you reach Liwonde, there are people waiting by the side of the Shire River who know your name and all have matching khaki clothes. Matching clothes is a big deal here. It means something very significant. In the U.S. where people chafe at the idea of uniforms, here it means you are part of something big. And more importantly, you are gainfully employed. As we loaded onto the riverboat my fears were there again. I knew we would see hippos, but if they could just see one elephant, then the pressure would be off for the rest of the time. We were about fifteen minutes on the water heading north on the Shire when we spotted three elephants getting a drink. We pulled to within twenty yards and all the cameras came out. Five minutes later we were looking at a herd, and then a few minutes after that a large elephant with a broken tusk eating grass at the rivers edge. And then the hippos and the crocodiles started. They glom together and provide an intriguing contrast. The hippos are smooth and round, the crocs are jagged and long. Unlike previous visits in April where all you saw of the hippos was the top of their heads, in July they were up and walking around the shore, lumbering slowly. The hippos didn’t move if we came up close, but the crocs did. They are less excited about being photographed. Each time they dove into the river and swam past the boat, Ruth asked, “will they come into the boat?” In all we easily encountered two dozen on the way to the camp and her question never ceased. It was clear that safari was more than sightseeing in her mind. Upon arrival we enjoyed the fine dining the camp provides and everyone was taken aback by the décor of the chalets and just the atmosphere. After lunch and a swim we headed into the bush for a game drive. We were looking for rhinos and zebra but found only antelope, impala, and elephant. In the night drive, we were lucky enough to spot a civet, jackal, and a white tailed mongoose amongst the waterbuck and the wild boar. Coming around the corner I was getting impatient with his speed and when he stopped on the path maybe twenty yards from where we wanted to go, he said, “there is a large elephant eating in front of Chalet #5.” This was Laura and Beka’s room. And the elephant was literally straddling their porch. We took a vote and this was the most popular moment of the safari. Later that night Kathy and I were awaken by an elephant eating right outside our window. It was a racket beyond imagination. Still half asleep I started to get up so to shoo it away. Luckily I woke up a bit more so as to remember, the elephant may not take to being shooed. The next morning Kathy, Beka, Laura and I joined our guide Duncan for a six o’clock bird walk into the bush. As was the case last year, this is a highlight for me. The birds in Africa are shocking in their variety and omnipresence. Everywhere you turn there is an intriguing bird to spot and watch. After our boat safari we headed out a bit before twelve. We sped down the Shire at a clip. As we did herds of elephants walked in the marshy grasses and hippos and crocs lined all available muddy spots. We watched fish eagles and kingfishers dive into the water. By that point no one needed to stop as we were flush with so many sights. Sometimes the reality is even more than the hype. Mark Purcell Goes to the DamboOn Saturday we made the drive from Lilongwe to Bandawe. 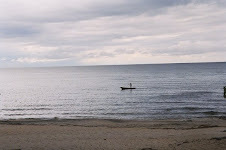 Mark Purcell was ending his trip to Malawi with a few days at the lakeshore and we were to join him. We pulled in around 3:30 and the stress of the drive just evaporated. Oh, the lakeshore. Mark and his sons, Andrew and James, arrived in Malawi a week before. They spent a few days in Lilongwe seeing the crisis nursery, a few days at Mvuu seeing the elephants, and then four days in Mzuzu being led by Sam and Grace. I gave some suggestions as to where they might lead the Purcells, but it was not necessary. When we met up at the Chinteche Inn James and Andrew were still excited about the day before. Grace took them to a DPP rally where she was the focus. “So your Dad made a political speech,” I declared. They both smiled and said, “yeah, he did.” “Never thought you’d see that did you?” They both shook their heads and continued to smile. As we all unwound a bit the details of Mark’s time in Mzuzu started to unfold. They pretty much jettisoned all the sightseeing and got to work. Mark, like the eight ladies from Watertown and Canton, was a bit bothered that we had purchased iron sheets for the widows of the dambo but had yet to get any of them installed. So instead of touring he jumped into inspection mode and then set about hiring contractors. All the ladies of the dambo now have new roofs installed. One house though was not salvageable. This problem led to negotiations to purchase a few acres on the outskirts of Mchengatuba so this one can, as Mark put it, “just have a whole new house.” I am not sure that dambo has ever seen a day like this one before: the day Mark Purcell came to town. I spoke with Sam later about the land in question and we believe we can get it for under a thousand, probably around $700. “There will be enough room,” Sam said, “for at least ten houses.” All the teenagers starting tossing around names for this new village. I think “Graceland” is the one everyone agreed to. I want to say it took Mark Purcell about ten minutes to figure out how much joy can be had in Malawi. The possibilities, the people, the rate at which significant change can occur are truly a lot of fun. I tried to stress to him how we need to get to work on the U.S. side. The church is still the umbrella for the widow’s fund, but we need to formalize it as a nonprofit. We also need to form a board and get everyone on the same page. When I told him I don’t want the U.S. board to be the decision makers, he smiled. “No, the people here should be making the decisions.” With that I could see he really got the beauty of being a friend of Malawi. It’s about creating the possibility of something and getting out of the way. The women of the dambo are very glad Mark gets it. Most pastors here carry a leather briefcase which holds their bible. My gut told me, they are going to ask me to preach. I have preached with a few hours notice, but only in Malawi have I experienced the pleasure of a few minutes notice. They took pity on me and made one of the elders do all the logistics and keep the service flowing. Had this been my first trip to Malawi I would have refused. Now though I know better and I just smiled and said, absolutely I will. As the service got started I tried to craft a message in my mind. I took the passage the elder was going to preach and figured the congregation and I would just “listen” to it together as if it were the first time for both of us, which was true. During the offering came the epiphany. Had I done my sabbatical at the lakeshore how I had intended, this would have been my lot. All of a sudden the image of Norman Hara came to mind. For six weeks I have worked with him and spent time with him and never did I feel dumped upon or used. In fact, it has been just the opposite. He has made sure that my time in Mchengatuba is not grunt work or that my presence is an excuse for him to let me take over. I knew in an instant that had I come to the lakeshore for the nine weeks I would have been working all the time. This would have been very problematic given the intention of my sabbatical. In Mchengatuba I haven’t been working; I have been abiding. Sometimes the abiding has been bitter like the night we met with the choir; sometimes the abiding has been joyful like the moment Sam and I walked the dambo. Be it hard or happy it has been abiding. Staring out at the congregration and remembering the words of the elders, “he didn’t tell us you were coming,” I thought, “Gondwe, Gondwe.” One Sunday was annoying. Nine would have not been any fun at all. What abiding reveals never ceases to amazes me. We stayed an extra day at Chinteche on the lakeshore. It hit us: the fatigue and the motion and the change and the sense of being gone. When I asked if there was room for another night, there must have been something in my voice, because the manager seemed pleased to say, “yes.” I was pleased as well. We needed another day of being on the beach, eating delicious food, and enjoying the sound of the waves at night. The weight bringing the exhaustion wasn’t one thing; it was a moment of too many things. I’ve tried to balance the two intentions of the sabbatical. The first intention was to learn more of Malawi than can be achieved in a two-week visit. This is my fourth time in Malawi and at this point I have exceeded the amount of time spent in the last three trips combined. I have now been around long enough that the rhythm of life is coming into focus; the friendships made in the past are being tempered by real life; and, most importantly, a complex culture is coming into view in ways I scarcely could have imagined. This has proven rather straightforward. I imagine it may have been forfeit if I had withdrawn, hiding myself away behind the gates of the McGill house. Yet, except for a few days of illness and two days of exegetical work on I John, I have made sure to be in the midst of people and places so I know more than a kind of cursory impression. The secret it would seem to ethnology is the same as being a pastor: show up, be in the midst, and listen. The second intention of the sabbatical has not proven as easy. Bringing my family into nine weeks of Malawi so they can share this part of my life has not been as obvious as amateur anthropology. With their suitcases came our life together; with their passports came emerging identities and complex relationships. It’s fair to say, I am a better pastor than parent, a better preacher than a husband. In this I am well within the experience of many men I’ve met. Deferring attention because there is more work to be done; being absent is excused as part of the job. Being together in such a different place, being part of every step and dust up has been a bit of a surprise. It wasn’t part of the sabbatical I asked the Lily Foundation to provide and First Pres to support. Yet, in some ways it has been even more revelatory than being immersed in a different culture. This “part” has made many things very transparent. Anthropologist might call this a “liminal” experience. Liminal is when we are taken to the edges, the edge of meaning where we can see ourselves and our life in a way that is profound and insightful. Another anthropologist might call my ramblings about our time in Malawi as “thick.” Thick in the sense that there are so many layers we are sifting through, so many parts of our life being exposed at one moment, it is rich and all too clear. Being so exposed, so transparent can be just a bit on the taxing side. There was the drama of trying to be a family in a new house, a new city, a new country, and a new continent. That was a bit of a stretch. Add to this the absence of all the creature comforts like friends, phones that work, television, and a newspaper that is delivered to my door at 4:00 am so I can read it at 4:30 each morning (not to mention a second newspaper that comes in the mail that I can read over dinner until Kathy chastises me). I’ve whined enough about driving that it need not be explained here, but I now long to drive on paved roads where there are no chickens, goats, bicycles, or children darting about. Each one of these has uncovered or revealed something in us, in me. We’ve talked for a few weeks now trying to imagine if it would have been easier if we would have done this or that. Yet, the conclusion we seem to reach is that nine weeks in Africa is a kind of challenge that has proven as enlightening as taxing. There was some heavy lifting that just is what it is. So an extra day at the Chinteche Inn was, shall we say, a very good idea. It was a great idea because we are not done yet. We are only 2/3 of the way through our time. That there will be more insights, more moments of “ahahs,” and more times where I stop and say, “I didn’t see that before” is pretty much a guarantee. Be that as it may, it is good to just be on the lakeshore for another day and rest a bit before the next round. Seeing this much of life is a gift, an extravagant indulgence that surprises me each time I think of it. It also comes with a heavy dose of emotional baggage. Preaching in Bandawe is always an adventure. Rev. Gondwe doesn’t stand on a lot of protocol in terms of order. If you are taking the service he pretty much throws you in. So I was prepared for nothing being prepared when arrived to preach on Sunday. Some might consider the lack of preparation Malawians bring to their life a kind of laziness, or at least a lack of appreciation for details. There is some of that. Malawians will be quick to castigate each other for being lazy. When I hear this I know I am in another culture. “Lazy” in America is a pretty serious accusation. We work hard to use it sparingly and restricting it to a specific event. A second grader may be told that their lack of effort on a project was “lazy”, but if that teacher were to tell a parent their child is lazy, there may be some sparks. Yet it is nothing for a Malawian to chastise a colleague for being lazy, for a pastor to exhort a congregation not to be lazy, and I have read in the national press calls by the President for the people to rise above laziness. I can’t imagine President Bush suggesting the rebound of our economy hinges upon our ability to not be lazy. My text for the morning was John 15, the Abide in Me passage. The sermon emerging from this passage had two purposes. The first was to explain why I didn’t come to the lakeshore for my sabbatical. There had already been some confusion when I appeared in June. Bandawe was for all intents and purposes the place where I felt at home. Why wouldn’t I come home if I were going to live for 10 weeks in Malawi? Abiding I explained is about not being at home, its about losing your home or giving it up: it is about being displaced. The Holy Spirit told me, I said, if you want to understand abiding you need to go to Mchengatuba. As this was the promise I made to my home congregation (I will spend the summer learning what it means to abide), I felt bound to follow the direction. At this point I interjected the story of Jonah saying this is where I wanted to be. All the Malawians needed was the reference and they got the point. When I told them I was a bit nervous when I get too close to the lake as the fish are quite large, they really laughed. As the service was winding down, Gondwe went to the lectern and gave an impromtu sermonette about sange. In fact he said sange is not a problem in this congregation, but it is a huge problem in the presbytery. Again the ladies from Northern New York were being given a glimpse of Malawi you don’t see on safari. Gondwe went into great detail about his experience of sange. With this the wires started to cross. One of the parts I truly admire in this culture is that if you have something you share it. There are no “leftovers” here. If you come into some money, you don’t save it, you help others. Some might suggest the down side of this is that it erodes initiative. The sense of dependence doesn’t work well with the motivation necessary to succeed, say, in business or in a career. A shop owner who “shares” all their goods is quickly out of business. Yet the person who does work and does succeed and saves money in this culture becomes a kind of cultural deviant. And so in Mchengatuba as someone succeeds and they don’t simply “share” but save or invest, they are in a cultural sense out of step, or in moral categories, doing what is wrong. Now the picture of a twenty year old who concocts a story about a second check from the U.S. and seeks to claim money given to the church has some clarity. They were supposed to come back rich. If they don’t get some money some place no one will believe them when they say, they don’t have any thing to share. And the idea that someone’s success is only a real blessing when it’s shared. It was about responsibility, Rev. Nkhoma said. Linda Potter asked him to explain how someone like Grace, a professional with tons of connections who is now running for parliament, was still without the leverage necessary to keep her in-laws from cleaning her out. How will this end was Linda’s point. Rev. Nkhoma never ceases to amaze me how he can clarify a cultural issue using history and how Malawi has changed in the last thirty years. In the last twenty years, arguably, Malawi has moved more and more from a purely subsistence economy, where cash was very scarce, to a cash based economy. People are still very much involved with subsistence, but with an ever present element of supplementing their income. The first three weeks we were in Malawi, Sam kept apologizing for the absence of his mother. She is in Msimba. What she was doing was bringing in their crops. They live in an urban place with everyone looking for work, but they also have crops in a field in their home village. The crops are brought in to feed their family through the year, but you can’t live on nsima. You need more. In Mchengatuba that means you need cash. Cash, while it is becoming more and more a part of the culture, is still hard to come by. You may need to send your husband to South Africa to work; you may need to pick tea at abysmal wages; you can try your hand at “business.” With any luck you will succeed. With success comes cash and with cash comes stuff. It is not uncommon to find a television in a Malawian home. It only gets the one free channel of bizarre public television but it’s on all day. It’s not uncommon with success for someone to have furniture in their living room, a stereo. They have stuff. I will never forget being in a home in Kabwanda. It was a mud house with mud floors and rough openings for windows. There was no furniture. Everyone slept on the floor. But in the corner was a television and a stereo run off a car battery. The husband was in South Africa. Now, when a husband dies (which is very common for the men coming back from South Africa; you can get a job there, but you will most likely become infected with HIV/AIDS as well), when a husband dies, his brother doesn’t come to take on his job in South Africa, he comes for his stereo. When a brother dies who had a good job in a city, his brothers don’t come for his hoe and his canoe, but the dining room set. Sange, when coupled with a cash economy, quickly eliminated the role of responsibility that came with the collections of a brother’s possessions. The only problem is that the widow is now just left without anything. And if sange is really in play, she is left homeless as the husband’s family takes over his house and kicks out his wife and children. It’s hard to say when this became a norm. I want to say I am just scratching the surface of a huge cultural shift. Hopefully this is a bad phase, a cultural crisis that will find a resolution. I hope. As August is closing in our time has started to take on shape. The first three weeks, phase one, were a kind of crash course, bronchitis fueled, struggle. There were a number of moments where Kathy and I wondered if a sabbatical where I explored my interest in the ancient near east or Italian food may have been more “sabbath” like. Sitting at the American Embassy yesterday we rehashed this. The intent of the trip was to deepen my understanding of Malawi and it’s culture so our mission work would have greater clarity and purpose, but also for my family to share this direction. If we are going to keep working with the Malawians, especially raise a Malawian child, we need to understand what this means as a family. In phase one, I don’t believe we achieved these objectives. What we encountered in the first three weeks was what it meant for Americans to live in Malawi. The McGills offered this picture in spades. They made clear all the hidden costs, the web of decorum and protocol that defines a culture that cannot begin a meeting on time, and the many of the dangers. A part of me wonders if we were too informed. Sometimes ignorance is bliss. Yet, I am glad we had these pictures as the success is much sweeter each time we navigate the dangers. Phase one was also just really, really stressful. Driving in Malawi is not something you come to enjoy in a few weeks. Just last night as we drove from Lilongwe to Mzuzu the car in front us had to dodge a violent brawl and then a nearly run over a drunken man who staggered into oncoming traffic. That’s just the extra fun of one drive. The usual subjects of stress (livestock, bikes, tobacco trucks, pedestrians, children playing, potholes that are crater like) are just part of getting from here to there. Phase two was about being hosts. The ladies from New York arrived with our “girls”. All of sudden we had two groups we were keeping track of. Laura, Zoe, Beka, and Chelsea had one schedule and the widow’s group had another. They all did great and were a blessing, but all of sudden we were interpreting Malawi to others instead of trying to understand for ourselves. In this we did learn a great deal about what it means for us to do mission in Malawi. And my family has now had a profound experience. The fellowship of friends from home also diffused some of the stress of immersion. It was during this time that “sange” started to emerge. I truly don’t believe I would have ever begun to understand this complex layer of Malawian culture on a two week visit. It came first as a warning from the McGills, “sange is a big problem here.” And then it came like a tidal wave, a kind of cathartic eruption in the village of Mchengatuba. And now we are heading into the last phase. What it will hold is starting to emerge. It seems as if we are finally ready to just enjoy the people and the places. Our guard isn’t completely down, but we are heading into the fruit of abiding. Jesus said in John 15 “abide in me.” He said this on the night of arrest; he said this to people just before he was crucified. And John wrote this to Christians who were being expelled from their church home and thrown into the chaos of being displaced. Yet, John 15:11 says, I say this to you so my joy may be in you and your joy may be complete.” This to me is the other side of abiding. I am not sure what form this may take, but it seems to be the theme of phase three. Abiding is about being displaced, and enduring, and trusting in the midst of chaos; yet, it is also the mysterious way in which joy is to emerge. Again, abiding is word that doesn’t disappoint. There is a reason John chose this image as a way of defining the church. As I look to understand what it means for the church to be in mission, abiding seems to provide a powerful answer. The Opportunity Bank Came to Mchengatuba. I am still trying to convince myself this happened. When Linda Potter wrote me months ago and said she would like to hook up with the folks from the Opportunity Bank when she is in Malawi, I thought, that will be nice. Futile, but nice. In the last few years I have become a bit jaded about any preexisting organization. I don’t want to sound like a paranoid, on the fringe protester, but I have lost a bit of confidence in the “institution.” If I am not growing it, making it from scratch, or doing it myself, why bother? This has become my question after trying to start with the larger group, the denomination, the established folk. So the idea of trying to bring in an established bank into our fledgling widows organization sounded like recipe for frustration. In the last too weeks of working with them the experience has been anything but. In fact things have really got cooking was a whole lot of progress and wonderful . . . well . . . opportunities. The first bit of progress was that the local Roman Catholic priest who heads up the benevolence ministries of the diocese said he would love to come with the staff member who works in Mchengatuba for a meeting with the Opportunity Bank and our Widows Organiztion. And the local Presbyterian pastor said, “I don’t know the priest but I would like to meet him.” They were both really excited about the Opportunity Bank coming out to Mchengatuba; and at the end of the meeting they both agreed to work with us. When we actually all sat down with the branch manager and the loan officer (Wilson and Peter) the excitement continued. The more we talked about setting up a local committee that would seek out and screen potential micro credit clients, and this committee would recommend projects to a widows organization board, and this board would have the choice of offering an endorsement to the bank made everyone excited. “And the bank is not bound,” I said, “to make loans simply because we endorse them, but simply sees our approval as a recommendation.” There were lots of nods around the living room of Grace Chiumia. A little more than a year ago Grace and I were sitting in the living room of Jim and Jodi McGill where we negotiated the first step of the “widows fund” as it was then called. Grace was quick to suggest micro lending and everyone said, too soon, too early. I still believe that was the case. The biggest reason we gave Grace then not to rush into micro credit is that you don’t want to be a bank. Yesterday that is exactly what I said to the folks from the Opportunity Bank. “I don’t want to be you; I am pastor; I don’t want to be a banker.” But I would love for the some of the funds that have been donated to help widows in Malawi be utilized as micro credit loans. They are eager for a chance to move out of extreme poverty and a micro loan has proven a very effective tool to do just that. After our quasi board meeting, Wilson and Peter met with two groups of widows and discussed the potential of one selling beans in the market and another selling poultry in Mchengatuba. I am not sure of the outcome of these discussions, but I do know what came of their meeting with Grace and her business partner, Sam Chirwa, to discuss the next step for the preschool they have opened: pre-approved. That was a great sign given that we have not yet deposited any money in the Opportunity Bank. When I am wrong I tend to be really wrong. How great it has been to be really wrong about this one. Linda Potter is a “mama molesia.” In the U.S. she is a life coach, a business woman, a Christian, a mother of three, Mike’s wife and much more. But in Malawi, she is “mama molesia” (the pastor’s wife). Being a pastor’s wife in sub-Saharan Africa carries an enormous amount of weight and responsibility. A pastor’s house, or manse, is part conference center, part vestry, part city hall/dining hall, and, when it’s not being used for these, a home run by the mama molesia. Most families in Malawi have between six to eight children. Add to this being a pastor means you have a steady job with an income so you are obliged to raise nephews, nieces, and grandchildren in addition to your own. I am not sure if Linda would let it go uncontested in the U.S. that she is “just the pastor’s wife.” In fact most people in Canton who know her wouldn’t let that stand, but in Malawi, “mama molesia” is enough said. The crowd always ooohs when her title is given. It is a safe guess that Linda, and her seven travel companions from Northern New York, weren’t ready for the way they would be interpreted as they sought to interpret the fledgling widow’s fund that was begun in Watertown in 2006. Yet again and again I have watched them see themselves through the lens of Malawian eyes. “Mzungu” is the most common title they each have received. Mzungu is the word for “white person.” At the village of Mzenga as they listened to political speeches for an upcoming parliament seat, their white skin was mentioned numerous times as a kind of shocking occurrence. That white people would come to Mzenga was hard to fathom. With my family and the ladies altogether, we equaled 15 mzungu. One or two would have brought the village; fifteen brought people from all 32 areas of this remote nook of Africa. Yet, perhaps the most profound and new way of being seen was to be seen as the one who can bring about a new world. I am not sure if the ladies from Watertown and Canton fully understood that they were being asked to fund these projects, but in fact, that is exactly what was happening. They were seen as the ones who can bring these things to Mzenga. The longer I spend time in Malawi the more this interpretation challenges me. My first response is to laugh when I think of how little chance there is that I could just write a check for $50,000 let alone four times that amount. Yet, the real challenge of these kinds of requests is the knowledge that “we” can bring this about if we chose. If we believe it is the right thing to do, we could very easily transform Mzenga with an ambulance or a school. It is really far within the realm of the possible. I hope at some point each one of the ladies from Watertown and Canton will begin to see themselves as the Malawians see them. They are hope; they are someone you can ask to change the world. And this world looks a lot different when you realize what a difference you could make if you chose to try. It doesn’t look easy, but it does look doable. At least one young man in Mzenga truly hopes they see the world the way he does. The district political leader shouted, DPP oye! “Dpp, oye!” he charged them again. “Oye!” They answered with a frenzy. The ladies from Northern New York (Heather White, Rita Gefell, Rene Waterbury, and Liz Bonisteel of Watertown; Linda Potter, Vicky McClean, Katrina Hebb, and Ellen Grayson of Canton) had strayed a bit from the standard tourist path. Malawi often presents these “alternative” tours and a political rally supporting their friend Grace Chiumia for a seat in parliament is definitely off the beaten path most visitors trod in the warm heart of Africa. In March of this year Grace came to Watertown and Canton to prepare the ladies for the trip to Malawi in July. The purpose of their trip was to interpret the widow’s organization Grace has developed with our funds. Upon her arrival in the North Country she was quick to broach an issue with me: with how I would feel about her running for parliament? Would I see this as a good thing? Her face lit as I said, “you are the sort of person Malawi needs to build the future. Do you need me to make speeches? I will do it.” We laughed at this, but I wasn’t joking. I had all confidence that during my sabbatical, at some point, I would be saying, “vote for Grace” to a crowd of Malawians. True to form, after a two hour drive into the bush and with all the introductions made to the few thousand people who had gathered on the football “pitch” in Mzenga; after all the people went wild seeing my wife, daughters, and the “ladies” from New York wrapped in chintengis (bright cloth worn as a skirt) imprinted with the face of the president of Malawi, I began my speech. I asked if the people could help me understand the politics of Malawi. Were there politicians here who liked to hear their voice? Were their politicians who lined their pockets? Were their politicians who just like to sleep instead of work? To each query the Malawians gave a tentative “yes.” They didn’t know exactly where I was going with this. Should they tell the visitor their real interpretations? I explained my relationship to Grace and her selflessness. But what truly needed to be said was spoken before all the speeches: she is someone who brings the unimaginable- a whole band of Americans to a remote village; she delivers a group of American’s to Mzenga of all places, a group whose only motive was to help the most vulnerable in their midst the widows. That is gold in Malawi. I am pretty sure I really didn’t need to stump, but there would have been great confusion had I not spoken. No matter. Malawians love speeches. And if the truth be told I would do it again, and most likely will. “Vote for Grace; vote for Grace!” I said before I sat back down. The frenzy of the thousands, the five different speeches, the dancing, the singing, the dramas, were just a bit different for the visitor. This was not a church event; this was not a business meeting: this was a rally. Again and again I spied our “ladies” and my family; their eyes were wide. As we left the rally, it was clear that we were in a different place. The van with the ladies was bedecked with three boys would had jumped on the bumper for a ride. As we drove away through the dispersing crowed they kept shouting in Tonga, “Grace has already won; Grace has already won.” This I hope is a true prediction of the vote count. Yet, as bizarre as the scene was for the ladies, as much as they might have wondered what other world they had stumbled into, it was clear they were a part of the hoped for victory, a part of something amazing. What do you like most about Malawi? That was Katrina Hebb’s question to me as we drove out of Mzenga in the rain through the tea plantation. Now if she had asked what are the things you like about Malawi . . . no problem. Beer is cheaper than water. People say yes and no when answering one question in the same breath. The lakeshore. The way a conversation is a kind of expectation and an art. I love that being in a hurry is really distressing to people. Although it has taken awhile to learn how to enjoy it, I find great pleasure that all plans are tentative and subject to great delays and postponement with non chalance. This list can go on and on. But what was the one thing I like the most? The dirt road was very slick so I needed to watch where I was going, but soon the answer came to me. “What I like the most is that you can change things, make a difference and its not Herculean, its not beyond everyone’s imagination. You can build an entire school for a fraction of the cost of a house in the U.S.” In fact a school is about the cost of a luxury car, maybe a little less. The tension of this question is a result of counting kwatcha. The exchange rate in Malawi right now is 140MK/1US. A bottle of beer is 50MK- thirty-five cents. A night at a beach resort with breakfast included 3,500MK or $25. I bought a lovely wooden bowl today for $10. Something like this would sell for $50 in the US or more. My point is that a daily part of life in Malawi for an American is to count kwatcha. Usually your are left with an impression: it can’t cost that little. I wouldn’t but I am starting to think I don’t want to buy an athletic field for a high school for a million dollars either. I balked when the wood carver started the bowl at twenty dollars. “Please, please,” I said, “be reasonable.” Such a price is gouging; it was. Yet, what about Chivumu Primary school and their desire for a “football pitch” (soccer field)? Would I balk if they needed $1,000? No. Would I wonder if they could get it cheaper or if they really need it? No. $1,000 is doable, a great investment in a community. Counting kwatcha has given rise to what I love most about Malawi: you can make a difference here for under a million. You can build an entire school for under $50,000. You can build dormitories, auditoriums, churches for something close. The annual cost for the malaria program at Ekwendeni is less than $4000. It’s not the bargain that has the greatest appeal; it’s how it reminds me and inspires me to do something. “You can do it” is what I hear so often in Malawi. That the Holy Spirit says this to me is like the bottle of pinot noir, quite a paradox. Abiding in Malawi is powerful. It upsets the apple cart in ways that need upsetting. We need to see our opulence and our decadence as unacceptable. Unacceptable not because someone else could use our money or needs our stuff or can be helped if we just didn’t buy $50,000 cars. We need to see it as a choice on our part. Can we make a better choice?